You save $4.45 Over 32% saving! This is a great continuous servo for RC boats that demand reliable steering! Read the review and see for yourself if this is the right servo for your hobby needs! "5" "lental" "March 12, 2015" "I bought this servo as a replacement for an identical one on my Phantom sailboat and it has worked well under all wind conditions. I will be buying several more for spares. Can't understand the negative reviews. I've had no problems with mine. As for the original, I burned it out by accidentally connecting a 3S battery without a BEC...no fault of the servo." "5" "Joe" "November 4, 2014" "First off, these aren't continuous rotation. For me with a Spectrum Dx5e, I got about two turns each direction. I needed continuous, though, so I opened them and pulled out the little clips as suggested here in the reviews. Now they're continuous, but it's impossible to get them perfectly adjusted. As a result, they are nearly always creeping in one direction or the other. Also, of the five I bought one came with a broken drum, only one came with all the mounting hardware, and some didn't have screws. So, if you don't modify them they are fine. Cheap, strong, and cheap. But they don't work well as continuous rotation." "5" "Emmons Chase" "October 2, 2014" "this is a grate servo its only fault is water getting in. I have burned up three of these due to water. i just got a new one and filled the base with grease to prevent the water problum" "5" "Michael Carter" "March 5, 2014" "Outstanding servo, has more than enough torque to pull a large sail. I see some people have been commenting on the continuous rotation. First of all it is correct a continuous boat servo will normally have a two to four rotation. It's an easy fix to change it to a constant rotation." "5" "Floyd" "December 28, 2013" "I have bought two of these and will probably buy more as my fleet expands. They make a wonderful platform for my GoPro camera mounted on the front of my FPV airplanes with the capability of adjusting 180 derees in both directions using a slider switch." "5" "Wayne" "March 6, 2013" "I use this servo as a sail winch in 4 of my one meter sailboats. It works great and is reliable. I recommend it to everyone." "5" "Tyler" "January 22, 2012" "*WARNING* Not what you would call a "continuous rotation" they only go 8 turns. However, they are very powerful and a wonderful servo for what they are intended to be used for." "5" "John Mckinney" "November 25, 2011" "I bought three of these for my sailboat , The Emma C. Berry. I used them to move the sails with a continious line from the drum to the boom, thus allowing the sails to move out left or right. These servos have more than enough power and turning distance to operate this ship and they performed flawlessly. The only caution I would reccommend is the flange on the drum is very fragile and will break if handled ruff." "5" "1970mgb" "October 1, 2011" "Excellent value! Works well, has good power and good rotational speed for my purpose. Highly recommend for value & quality." "5" "David S" "July 22, 2011" "It's a boat wench Servo. Which means it can rotate 360 degrees but it has a 8.5 turn Potentiometer. Which means it only rotates 8.5 turns from one stop to the other. However it is incredibly east to convert. - No cutting - No soldering All you have to do to convert it to continuous is remove the gear side cover and remove a clip with your fingernails. Then rotate the pot until it's centered. Because it's an 8.5 turn pot you can use the pot it already has. Thats it your done. The things has more than enough torque for robot drive systems. My application was to have four servos drive 4 wheels and a 6 ibs bot. The wheel is is 3-4 inches for proper speed. I can easily take more load then that. The horn to use is the one for the B1228 which they sell separately just search for B1228 horn." "3" "Forrest T." "February 18, 2011" "I found the EXI continuous rotation servos are quite helpful in my robotics projects!" "5" "Dave" "January 27, 2011" "I actually bought this for my predator drone r/c plane. I needed a servo to spin the camera pod on the front of the drone. It worked great. Nice and steady as well as slow , just what I needed." "5" "joe maneri" "December 22, 2010" "Good servo, good price. Mine has 4.25 turns end to end. Great for larger sailboats." "5" "Phil Bryan" "August 9, 2010" "Here, in Houston, many of us in R/C boats are using this servo with very good results. It's a pleasure to find a great price and quality together." "3" "Multihull Sailor" "January 23, 2010" "The unit provides good torque to handle sail sheeting - but it is 3 revolutions (takes in a lot of string) and unfortunately VERY slow compared to equal torque arm winches that are much faster. Highly recommended for anyone need a lot of mainsail boom movement, just allow time for the servo to make its turns." "5" "boy from ohio" "April 2, 2009" "my dad found this for me on my boat project. 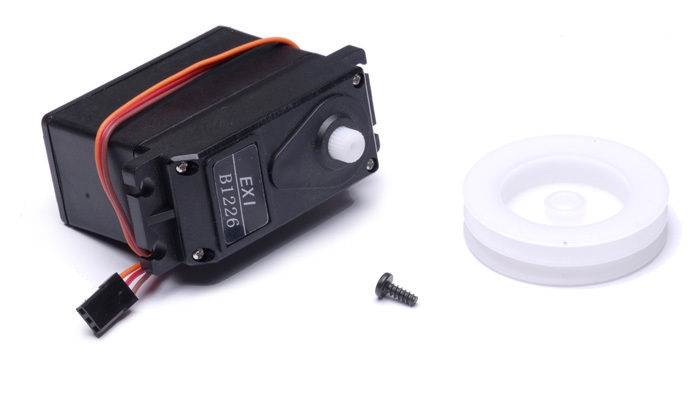 i use them and i like it alot"
120G EXI Servo w/ Continuous Rotation B1226 (Great for RC Boats) EXI-Servo-B122655March 12, 2015I bought this servo as a replacement for an identical one on my Phantom sailboat and it has worked well under all wind conditions. I will be buying several more for spares. Can't understand the negative reviews. I've had no problems with mine. As for the original, I burned it out by accidentally connecting a 3S battery without a BEC...no fault of the servo.